From stunning sandy beaches to tropical waterfalls, Jamaica is a beautiful island honeymoon vacation destination. Whether you are looking for a full service luxury resort where all your meals and activities are included in the cost of your stay, or an affordable room over the water, here is our list of the best Jamaican escapes for couples. Unique hideaways include a sea view villa with a private recording studio, a hotel carved into a cliff and a spa retreat in the Blue Mountains. Couples Negril is a romantic beach resort, surrounded by an 18 acre tropical garden with ponds, two outdoor pools, trees and flowers. Soft white sand and turquoise water of Bloody Bay are just steps from your room. The all-inclusive resort is a great idea for honeymooners and couples who want to get away from it all and try a variety of outdoor activities. Negril is 5 miles from the hotel, the Negril Hills Golf Club is 9 miles away. You can visit the famous Jamaican Seven Mile Beach nearby. On your romantic getaway, splurge on a suite with a private balcony overlooking the Caribbean Sea. The hotel has 234 rooms and suites in five categories – Deluxe Ocean, Deluxe Garden, Garden Suite, Deluxe Beachfront and Beachfront Suite. Some rooms have a private patio, while others have a balcony. Rooms and suites are decorated with colorful contemporary local artwork reflecting the nautical surroundings of the island. The restaurants serve a selections of delicious pastas, Mediterranean specialties and local delicacies. Cassava Terrace is open for breakfasts, lunch and dinner. Try the juices, cereals, pastries, fruits while enjoying scenic views from the open-air terrace. Beach Grill serves grilled specialties and an extensive dessert buffet. Heliconia serves Mediterranean flavors, pastas and grilled foods. Lychee serves a fusion of Asian foods. If you want to sample Caribbean and Jamaican fare, head to Otaheite restaurant. Couples can request a private dinner on the beach to celebrate their honeymoon, engagement, anniversary and other special occasions. There are four bars, playing reggae, piano and Caribbean tunes. The Piano Bar is a favorite for its cocktail menu. Listen to reggae rhythms or steel drums at The Jamaican bar while you sip the choicest wines and other beverages. Oasis Spa is one of the best in the Caribbean, offering holistic therapies in secluded tree houses, indoor treatment rooms and in an open-air thatched hut on the beach. Resort rates are all-inclusive, giving you a chance to try many different activities, such as Glass Bottom Boat Ride, Windsurfing, Hobie Cats, tennis, golf, Yoga, Pilates, scuba diving, catamaran cruises, several local tours and even a free wedding ceremony (876-957-5960, website). 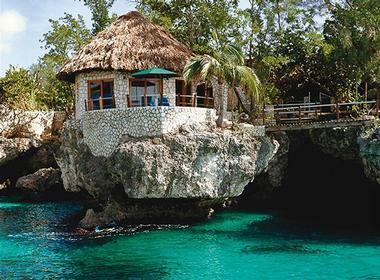 The Caves is a romantic island getaway located near Negril on the western tip of Jamaica, overlooking the Caribbean Sea. The hotel is a place for couples looking for a romantic, secluded spot with spectacular sunsets, unique rooms and good food. Guests can relax by the saltwater pool, get a massage in an open-air gazebo, or climb down a ladder into the sea to swim or snorkel. The resort offers romantic rooms in ten hand crafted wood and stone cottages set on top of the caves carved by the sea. Each room is uniquely decorated and some have a view of the Caribbean Sea. Stairs and walkways take guests from the cottages to the saltwater pool, sun-decks, jacuzzi, hot tub, hammocks and a furnished cave. These unique rooms are popular with honeymooners. Jamaican-style food is carefully planned each day, from details such as Jamaican Blue Mountain coffee for breakfast, fresh fruit and juices served during the day and a varied dinner menu that changes daily. All the food is prepared at the resort and is included in the room rate. Guests can dine in a cave for a unique experience on their romantic vacation. Guest can enjoy the privacy of the resort or explore the surroundings. The property is located on the West End Road which features shops, local artwork and restaurants. 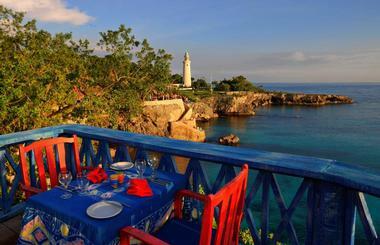 The town of Negril provides nightlife with clubs, bars and discotheques, restaurants and live performances. 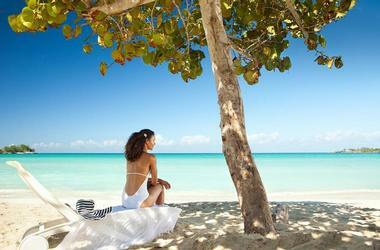 Negril's seven-mile beach, the longest continuous stretch of white sand in Jamaica, is 10 minutes by car from The Caves. Find your favorite stretch of the beach and coconut palm tree to relax near the sea. The hotel can arrange many activities, including watersports such as parasailing, snorkeling and deep sea fishing. Hiking trips are available to Mayfield Falls and other destinations. If you prefer to explore the island on your own, public transportation is available in the form of mini-buses and taxis. You can also grab a free bike, rent a car or a motorbike. Book between late October and May to avoid the hurricane season. Montego Bay International Airport is approximately 3 hours and 20 minutes from New York, 90 minutes from Miami and 6 hours from San Francisco (including the layover). Rates from $525 per night based on single or double occupancy. Check for honeymoon packages (800-OUTPOST, website). If you are looking for unique romantic beach getaways, the Rockhouse Hotel is a small affordable boutique hotel set right on the water's edge on two and a half acres, just west of Negril on the western most point of Jamaica. The relaxed atmosphere makes it an ideal Jamaica vacation destination for anyone looking to kick back and have drinks by the pool. There are 28 guest rooms. The 10 villas, 12 studios, and 6 rooms have all been designed to blend into the rocky cliffs and jungle like garden of the resort. Rooms have a fully stocked mini bar, an in room safe, telephones and ceiling fans. The villas are all located near the edge of the coral cliff. These individual thatch-roofed cabanas have wrap-around terraces with lounge chairs, sliding glass doors that give you great views of Pristine Cove below, and outdoor showers open to the sky above. Guests can sit in their villa and enjoy the sounds of the waves below while sipping on Jamaica's famous Blue Mountain coffee on their romantic getaway. The twelve studio rooms and standard rooms are grouped together in two buildings on the property. The studio rooms have balconies that provide water or garden vistas as well as semi-outdoor showers. The standard rooms have balconies with garden views. The centerpiece of the resort is its sixty-foot freshwater swimming pool carved into the cliff's edge. Guests can sunbathe next to the pool or lounge on a floating mattress in the pool. In addition to the pool, guests can follow the ladders and stairs into the water of Pristine Cove to swim and snorkel in the ocean. The crystal clear water affords fantastic views of various sea life and corals, perfect for an active Jamaican vacation. If you are hungry during your time at the pool, the pool bar serves a grilled lunch of chicken, fish or a burger. For a more substantial meal guests can try the Restaurant. 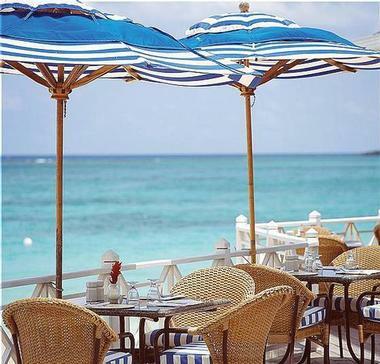 In a open-air atmosphere overlooking the water, the Restaurant serves classic Jamaican cuisine with a modern twist. Try the coconut toast or the jerk chicken spiced with scotch bonnet sauce. The restaurant offers a "specials" board which is updated on a daily basis. To get to Negril you should fly into Montego Bay. From there, it's approximately a two-hour car ride to the resort. Room rates range from $95 to $395 US per room per night (876-957-4373, website). Have you ever thought of recording your own album while on vacation? Make the dream a reality at Geejam Studios, housed at the Geejam Hotel, located on a sandy beach in Jamaica. Swim in the Caribbean Sea and record your songs in the studio. The hotel fronts a white-sand beach with open ocean views and plush lounge chairs. Drop in for a snorkel and admire the colorful coral reef filled with tropical fish. Visit Molly Hole, a warm water natural spring, for healing and rejuvenation. There is high-speed internet access on the beach if you want to post an update on your profile and make your friends jealous. Hang out at the Bushbar which features a sound system, outdoor pool table and panoramic ocean views. It's a great place to enjoy a sunset with a tropical drink. Each day, hotel chefs prepare a selection of croissants and fresh breads first thing in the morning. The restaurant serves a continental menu and a variety of Jamaican starters. Enjoy dumplings, seasonal fruit and vegetables. Each of the villas is unique, individually decorated with elegant furnishings and unique art. Most offer spectacular views of the sea from their outdoor decks. Several different guest room and suite layouts are offered at the hotel. Drum & Bass is located right next to the recording studio. The suite has a Jacuzzi and panels that fold out to turn the room into an outdoor veranda. Built in the late 1960s, Sanwood has a distinctly nautical decor, perfect for boating enthusiasts. The villa consists of three guest rooms, verandas and a private swimming pool, perfect for relaxing in the Jamaican sun. Sanwood has its own dining room where you can either order from Bushbar or ask the chef to prepare Jamaican cuisine. If you love relaxing in an outdoor Jacuzzi, Ska will be perfect for you. The Jacuzzi on one of the two outdoor verandas has views of the forest and the ocean. Glass doors can be completely opened for a delicious indoor/outdoor experience. Mento features unique rainforest surroundings, an bathroom with a steam room leading out to a patio with a Jacuzzi and a hammock, perfect for a relaxing holiday in the Caribbean. The cabin has high ceilings and sea views from the veranda. Book this house for best views of the Mack Bay waterfront and to enjoy the ouble steam room. Drum & Bass houses the fantastic recording studio and offers spectacular ocean views from its outdoor decks. Brazilian cherry wood foldout panels turn the indoor space into an outdoor space in a blink. There is a Jacuzzi, comfy lounge chairs and a Philippe Starck bathtub in the bathroom. Enjoy the sounds of ocean as you take a nap on the outdoor deck. Rates start at $595. The Drum & Bass suite is $755. Book early if you are planning to rent the studio. If you are planning a romantic Caribbean wedding, the whole property can be rented from $5,400. The hotel offers several wedding packages, whether you want to elope or bring the whole family. The property often offers packages which are great for longer stays. The 5th night free romantic getaway offer includes: breakfast, drinks, airport pickup, $100 spa credit, $100 dining credit, Studio & Castle Tour (876-993-7000, website). If you are looking for the ultimate all-inclusive honeymoon resort in the Caribbean, check into Couples Sans Souci in Jamaica. The 35-acre adults-only getaway offers spectacular views, five star service and breathtaking views The resort has 150 romantic suites with ocean views, so you really can't go wrong with booking your stay. If you want to be right next to the ocean, ask for a One Bedroom Beachfront Suite with a private patio or balcony just steps from the beach. These suites have bathrooms with a large Jacuzzi tub and a walk-in-shower, perfect for a romantic honeymoon getaway. The most secluded of all the guest accommodations is the Hibiscus Cottage, set on a cliff overlooking the Caribbean Sea. The cottage has a private outdoor infinity-edge Jacuzzi from which you can look out to sea. Ristorante Casanova serves a diverse menu of traditional foods with tropical Jamaican and Caribbean ingredients. Palazzina Bistro serves freshly-made bistro dishes and international cuisine on a terrace with captivating views of the Caribbean Sea. 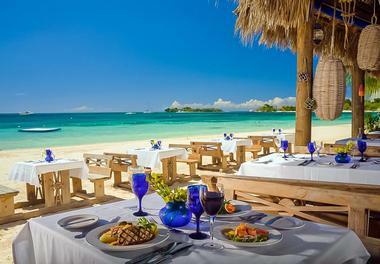 Casual dining can be enjoyed on the beach with spicy and authentic Jamaican dishes at the Beach Grill/Bella Vista. Honeymooners should ask for a romantic candle-lit dinner on the beach. Choose from six different bars with wine and spirits from around the world. Live music helps create a lively romantic atmosphere. Charlie's Spa is one of the top spas in the Caribbean, offering a full selection of rejuvenating and soothing treatments. The mineral springs on the property have been used since the 1700s for their healing and relaxing properties. The resort has a 24-hour fitness center equipped with the latest exercise equipment. Offerings include meditation, Pilates, aerobics, yoga and aquacize classes. Play unlimited golf at the nearby 18-hole, par-72, 6,311-yard Sandals Golf & Country Club in Ocho Rios. The course is one of the most scenic in Jamaica, overlooking the sea and the mountains. Relax next to the resort's four swimming pools and on the private beach. For active couples, the resort offers tennis lessons, scuba diving and water sports. Tours and excursions include glass-bottom boat rides, Jimmy Buffet's Margaritaville in Island Village, Dunn's River Falls and shopping trips to Ocho Rios. Couples Resorts are famous for their attention to detail and beautiful wedding decor. The resort offers a selection of personalized wedding packages that match your budget and preferences. Pricing is all-inclusive for a week-long stay. Most resort activities and tours are included in the cost of your stay (+1 876-994-1206, website). 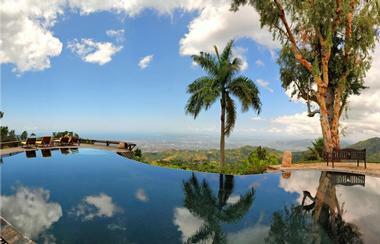 Strawberry Hill is a mountain spa hideaway in Jamaica's Blue Mountain range. This is the place to go if you want to indulge in spa treatments and relax in a calm mountain setting. Guests enjoy great mountain views, a negative-edge pool, gardens and a full-service Aveda Concept Spa. Spa treatments to try on your Caribbean spa trip include massage, facials, body care, hydrotherapy and an exclusive Aveda treatment - the Himalayan Body Treatment. Set on 26 acres, the 12 cottages feature unique 19th century architecture with French doors and private verandahs for enjoying the view. Breakfast, lunch and dinner are served in the restaurant which offers "new Jamaican cuisine." If you prefer a stricter diet, spa entrees are available on the menu. The spa retreat is located 3,100 feet above sea level, approximately one hour from Kingston Harbor. Mountain hiking and mountain biking trails of varying difficulty levels surround the property. Guests can explore the mountain trails of the Blue Mountain range on foot or on a mountain bike, available from the resort. Nearby tours include a visit to the Old Tavern Blue Mountain Coffee Estate with a picnic lunch. Jamaica's beaches can be reached by car. VacationIdea.com Tip: To get a full flavor of Jamaica, combine your stay at this hotel with a stay at one of the other Island Outpost properties located on the sea. The Caves is a unique resort set on top of volcanic rock near Negril on the western tip of Jamaica. Alternatively, you could visit Jake's on the south coast. Helicopter transfers can be arranged between the properties. Montego Bay International Airport is serviced by major airlines and is about one hour from Strawberry Hill. Car rental is available near the airport (if you can drive on the left). Alternatively, ground transfer to Strawberry Hill is available for a fee. Guests can also arrange a helicopter transfer (a 40-minute flight costs about $600 per person one way, up to four passengers). Rates from $325 per night based on single or double occupancy. Remember to check for specials (1-800-OUTPOST, website). Relax on the soft sandy beach at the all-inclusive Sandals Negril, go snorkeling, scuba diving and enjoy many other activities. Enjoy five star service and luxury amenities at Half Moon. Rent a villa and spend your days relaxing on the sandy beach. The spa at Sandals Royal Plantation is a getaway for the senses. The spa has marbled treatment rooms and offers an array of treatments. If you are on your island honeymoon, book a couples treatment at the spa and relax and re-connect. While you can spend your entire vacation at the luxurious five star spa, there are many other activities not to be missed at the resort. Scuba diving is complimentary for certified divers. Golf is included in the nightly rate as well. The private cottages at Jake's are unique and affordable, a fun romantic idea for couples heading to the Caribbean. Hang out by the pool bar and lounge with a view of the water. 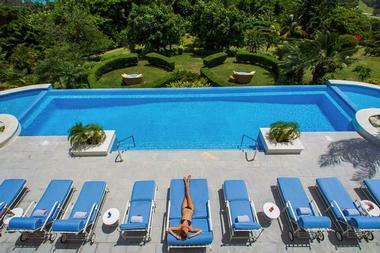 The Tryall Club is as luxurious as it gets. The resort is home to the famous Tryall's Golf Club which frequently hosts golf championships. Families can rent one of the private villas in a gated community which includes a housekeeper. The hotel has a fitness center, scenic jogging trails and a variety of water sports. The Wildlife & Nature Program include snorkeling and free diving, coastal discoveries and coastal kayaking. 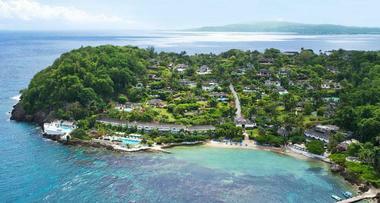 Round Hill Jamaica in Montego Bay is another luxury option with its own beach, spa, tennis and other sports facilities. 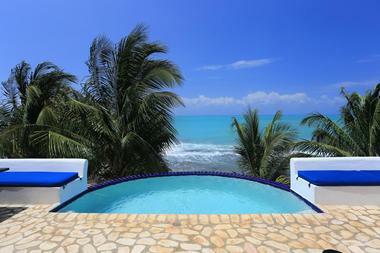 The swimming pool overlooks the clear blue waters of the Caribbean. Vacationers have a choice of oceanview rooms as well as private villas located on the hill. Nearly all villas have private pools. Round Hill offers casual and more sophisticated dining, or you can take the free shuttle to Montego Bay. The hotel has a full service spa located in a restored 18th century plantation house on 10 acres. The spa has an indoor and outdoor fitness center, full service beauty salon, seven body treatment rooms and an outdoor treatment area in the garden. Try the Pineapple Body Buff which employs freshly harvested pineapple and local polenta to gently exfoliate and smooth the skin. The exfoliation is followed with the application of an aromatic blend of ultra rich pineapple butter. There is a fitness center located at the spa. The waterfront lawn offers a beautiful setting for afternoon yoga classes. A light spa menu is served daily from 11:00am to 5:00pm. Jamaica is known for its relaxed atmosphere, plenty of sunshine and, of course, its white-sand beaches. 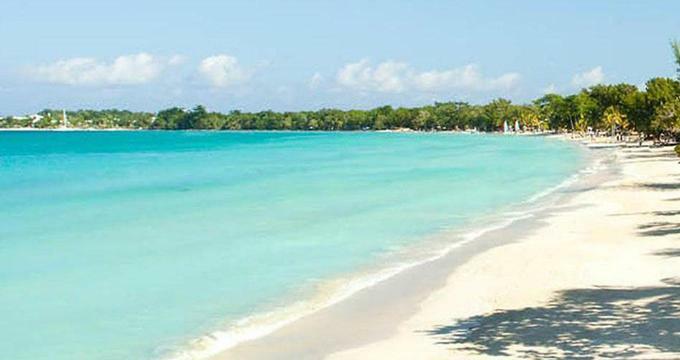 One of the most famous, the Seven Mile Beach in Negril, is perfect for swimming and snorkeling. Since it is protected by a reef, it offers calm waters. Hotels in the area include the Rockhouse Hotel and Caves Resort, popular with honeymooners. Where the Dunn's River Falls meet the sea, in Ocho Rios, lies a beautiful beach with lush tropical plants as a backdrop. Just east of Ocho Rios is Reggae Vibes Beach with secluded areas where one can come across nesting turtles. James Bond Beach, 20 minutes from Ocho Rios, offers clear waters and beautiful views of the St. Mary mountains. 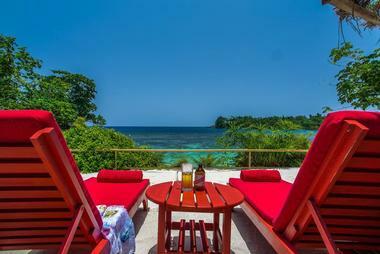 Shanshy Beach Complex, located to the west of Port Antonio, is divided into two parts by a fence. On one side lie huts belonging to local fishermen. The other side of the bay, with its white sands and shallow areas, is great for sunning and swimming. Montego Bay onthenorthwest coast is one of the most popular tourist destinations with more guest rooms than any other part of the island. The bay features white-sand beaches, historic buildings and art galleries. Vacation activities include five 18-hole championship golf courses and scuba diving in Montego Bay Marine Park with 10 square miles of coral reefs. For kids, the area offers several parks, including banana boating in Aquasol Theme Park, Blue Hole Nature Park and Animal Farm. Shops with items ranging from straw baskets and handmade leather to duty-free china and perfume line the bay. Honeymooners looking for private villa rentals, the Tryall Club is a 2,200 acre gated community where you can rent 69 private villas. The club is also home to a golf course which has hosted several international events. 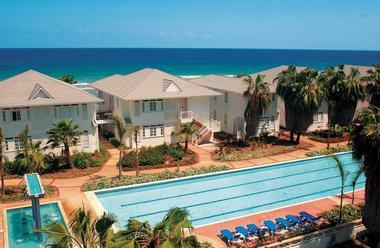 Jamaica offers travelers many different accommodation options and activities. Surrounded by the Caribbean Sea, the island offers great snorkeling, scuba diving and other ocean-based activities. In addition to that, there are beautiful waterfalls and mountains, great for hiking and relaxing with a view. 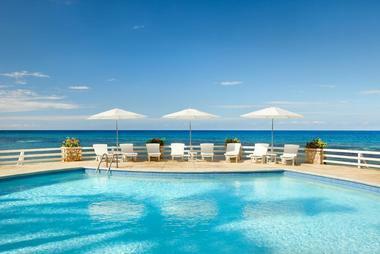 You can stay at a large full-service resort like Montego Bay or an intimate hideaway. There are many seasonal events and festivals, shopping, a variety of restaurants and beautiful sandy beaches. This is a bird watching paradise. In Montego Bay, you can find full service resorts offering luxury spas, golf, facilities for children, shopping and diverse nightlife. Other fun places to visit are the Seven Mile Beach in Negril, Kingston, Ocho Rios, Port Antonio and off the beaten path South Coast. With its 250 species of birds, Jamaica is a great bird-watching destination. Jamaica's national bird the streamer-tailed Hummingbird or Doctor Bird - and 26 other bird species cannot be found anywhere else other than on this Caribbean island. Many bird-watchers visit to see the vervian hummingbird, the second-smallest bird in the world, as well as the Jamaican tody which nests underground. Visit Dolphin Cove and its surrounding four acres of lush tropical rain forest with tropical birds and reptiles. In addition to bird-watching, you can also swim with a family of bottle-nose dolphins at Dolphin Cove. Visit the waterfalls to enjoy some of the best scenery on your vacation. At the famous Dunns River Falls in Ocho Rios, visitors can climb 600-feet and view a series of waterfalls. Professional guides supervise the climb. After your Dunns River Falls visit, relax on the tropical beach below where the falls hit the sea. Located on the undeveloped south coast, Y.S. Falls feature ten separate cascades. Great swimming holes can be found near the Mayfield Falls in the Dolphin Head Mountains. These falls feature 22 mini-cascades, an underwater cave where visitors can swim and mini-cliffs for high diving.